The AEO2018’s projected increase in domestic natural gas consumption is driven by the industrial and electric power sectors. The U.S. industrial sector, which includes both lease and plant fuel and liquefaction fuel for liquefied natural gas (LNG) exports, currently consumes more natural gas than any other sector, and its natural gas consumption is projected to grow faster than in any other sector. 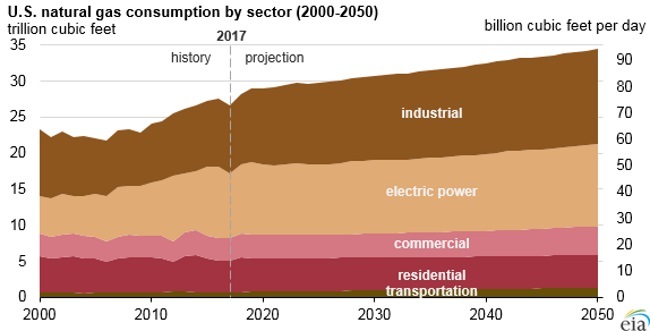 EIA expects a 34% increase in industrial natural gas consumption in the Reference case—from 9.8 Bcf/d in 2017 to 13.2 Bcf/d in 2050.